Description: You'll be hard pressed to find a more scenic alpine lake than Lake Isabelle. Situated in the cirque of the Indian Peaks it offers unequaled views of the Continental Divide and Isabelle glacier. 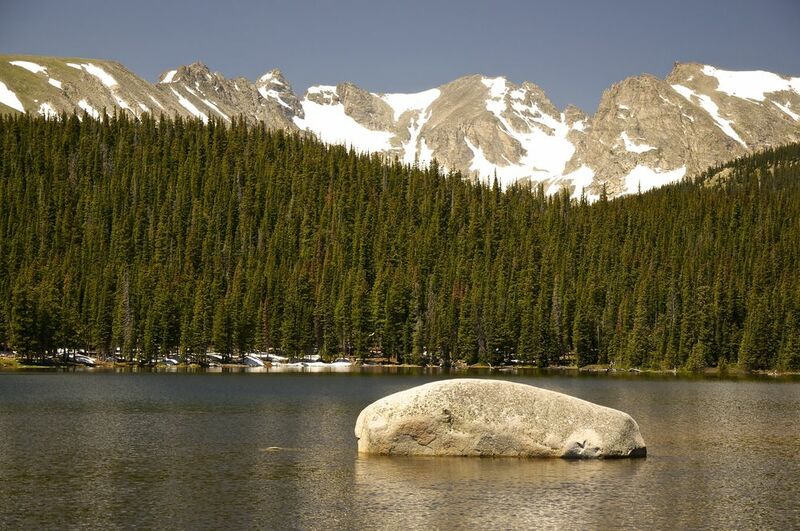 It is located in the Brainard Lake Recreation Area (BLRA), part of the Indian Peaks Wilderness Area (IPWA). 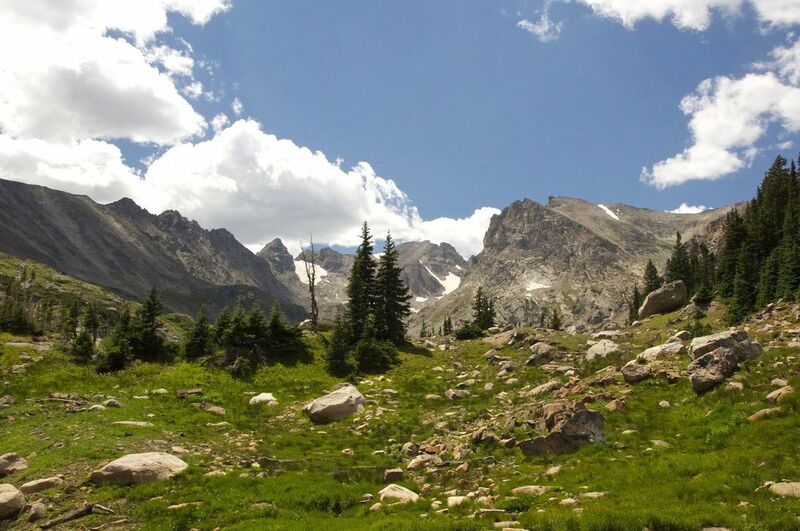 On this hike you will be provided with many memorable views of the Indian Peaks, Niwot Ridge, Isabelle Glacier and Mt. Audubon. This hike is an extension of the easier Long Lake Trail that circles Long Lake. Challenge Level: Intermediate, 6.7 Miles, 787' Total Elevation Gain, 4 Hours - Lake Isabelle should be reserved for later in your vacation when you are more acclimated to higher altitudes as it starts at 10,300'. It's a hike best suited for adults in reasonably good physical condition and active kids. For those desiring a less strenuous hike, check out the equally beautiful Long Lake Trail. For the more athletic who are looking for an all day adventure, you may want to consider the longer version of this hike up to Pawnee Pass. Most parking is in the parking loop east of Brainard Lake, which adds some asphalt to your hike. Parking: Parking in BLRA is now limited to the overflow parking at the beginning of the Brainard Lake loop road. This means the first and last 1/2 mile of the Lake Isabelle hike will be on asphalt. There is no longer parking along the road. A ranger told me there is still parking at the trailhead but don't count on finding a space. The road can be used in summer months to drop off riders or supplies at a picnic table around Brainard Lake, as it's a favorite picnicking spot for visitors. Trail Guide: Head up Niwot Cutoff as it winds through majestic pines. You will probably notice that you are climbing both by the switchbacks and by the shortness of breath you are feeling. Take rests as needed and you will soon notice how you are acclimating to the altitude. If it's a hot dry day, you may run into swarms of mosquitos, so you might be wise to bring some bug repellant with you on your hike, or lather up at the parking area just in case. Quickly the trail starts to flatten out a bit and open up providing a glimpse of Long Lake as you approach your first intersection at 0.6 miles from the trailhead. Down to the right you will see the old bucket of a mining cart and a little further a wooden bridge you will cross on your return. The banner image for Beyond Boulder was taken on this bridge. Enjoy the view, then continue straight along the south side of Long Lake on the Jean Lunning Trail. During July this meadow is covered with wildflowers. You will wind in and out of pines along the trail and crossing small streams. At about 1.7 miles from the trailhead you will come to a second wooden bridge where you cross the South St. Vrain Creek. Here water coming from Lake Isabelle feeds into Long Lake. At about 2.0 miles into your hike you will come to a split in the trail, with the Pawnee Pass Trail rising back to the left and Jean Lunning Loop continuing straight toward the north bank of Long Lake. Turn left onto Pawnee Pass and start the climb to Lake Isabelle. After a steady climb of about 3/4 of a mile you will reach the natural spillway of Lake Isabelle. Look for a small trail that heads out to the falls for some great photographs. Continue along the north side of the lake to find some great places to rest and look at the views. When ready, head back down Pawnee Pass. At the intersection with Jean Lunning Loop continue straight (don't backtrack the way you came) and in about a 1.0 miles you will come to a wide area in the trail. Turn right to cross the bridge you saw earlier, and pass the mining cart bucket. Rise to the south side of Long Lake and at the intersection turn left to return to the trailhead on the Niwot Cutoff Trail. 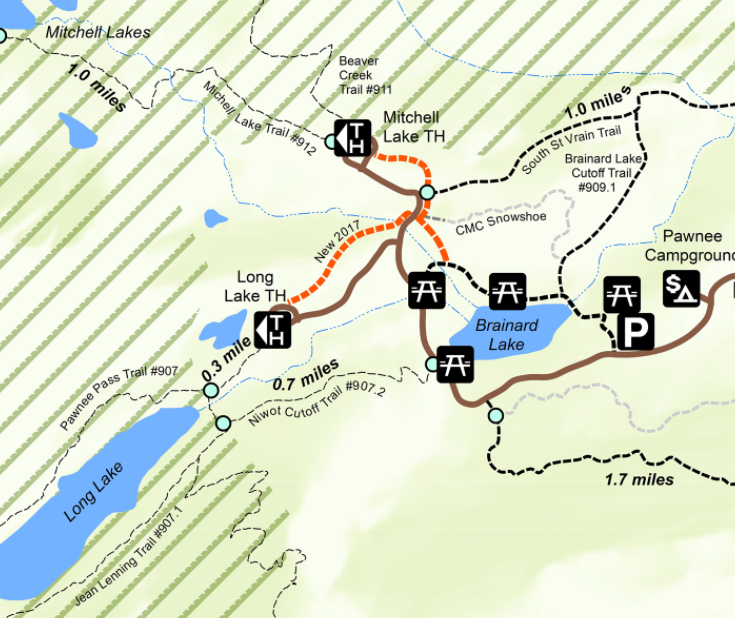 Map Resources: EveryTrail Map; US Forest Service (Ward); Also, the BLRA offers a great map for the asking when you pay your entrance fee. Après Hike: You will no doubt develop a deserving thirst after any of the great Indian Peaks hikes, and there's no better place for an après hike beer than Boulder Beer on Walnut. In 2017 Boulder Beer merged with the original residents at this location, Walnut Brewery, and in honor of Boulder's original brewpub retains some of their classic beers at this location. One of my favorites you won't want to miss is Walnut's St. James Red, a great Irish Red. They are located on Walnut in the heart of downtown between 11th and Broadway and host a great food menu to boot. Picnicking: Many beautiful options with tables and grills around Brainard Lake and parking areas. Restrooms: Plenty at parking lot and trailhead.